The Ortofon 2M magnetic cartridge system is designed and developed for high performance reproduction of analogue records. Originally had an Ortofon VMS 20E and was looking for a good quality:price balance and The 2M Red seemed to be a good candidate. Took around 20 minutes to replace the old cartridge, align and calibrate the 2M Red. As of writing I've listened to half a dozen vinyls with a lot of violins and percussion to check on review about the 2M Reds hissy highs. I guess it boils down to overall system setup as I was lucky enough not to experience and unpleasant sound. My setup is no hi-fi level which may explain the lack of reproduction. But it's musical to my ears. Bottom line, the 2M Red is worth the $100. I noticed there are very few posts. This is a follow up to my earlier post when I had just purchased my Ortofon 2M Red. I have had the cartridge for about 4 months now and I believe it is pretty well broken in now. My opinion of this cartridge hasn't changed much. I am still greatly enjoying the sound. As it has broken in I notice the sound is smoother(a little less forward) which is what I had hoped would happen. Although I have not had the oportunity to really compare this cartridge to other products (my budget doesn't allow for much experimentation) I can say that the sound quality greatly exceeds CD sound and thats good enough to get me back into vinyl and start expanding my collection. I wouldn't say the cartridge is flawless but I believe it is very impressive performance for the price. 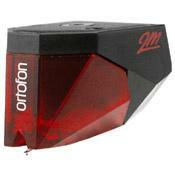 Just purchased a Ortofon 2M Red yesterday (Target Hi Fi, London ON) for $100. I read lots of reviews of lots of cartridges before deciding what to buy. So far I am still warming to the sound but I did not find anything objectional yet and I believe it will only improve as it breaks in. This is my first foray into the world of modern magnetic cartridges (just got back into vinyl last year). I am using it on an old Dual 506 playing through a Denon PMA 520 to a pair of home-made transmission line speakers. The speakers use Focal drivers (tweeters are the TC90 inverted dome, titaniums with phase plug, woofers are 5W3211B 5 1/4" "W" sandwich with phase plug). Spent a lot of time tweeking the cross-over and optimizing the base response using an RTA (Real Time Analyser) to plot the frequency response (30 - 20,000 +/- 5 db). As you may have guessed my passion is really speaker design more than audiophile. Of course the two go hand-in-hand. I think it is important to note that the cartridge is just one link in the audio system and, unless money is no object, sound reproduction is colored at best and often purposely distorted to appeal to different tastes and listening preferences. That being said, back to the Ortofon 2M Red. I read at least one complaint that the cartridge exibits excessive sibilence. As a speaker designer/builder I have had my share of struggles with sibilence and sizzle. I found some of the metal dome tweeters particularly difficult to tame in that respect. To me sibilence is most noticeable in voice. More specifically the way s's tend to hiss or sizzle. I believe one cause may be the poor damping of the metal dome material which allows certain high frequency harmonics to resonate. Sometimes I have had to subdue the higher frequencies with the cross-over to reduce this affect. The trade-off is the loss of brightness on the high end which can reduce the amount of detail in the sound. Where I am going with this is, I believe speakers are usually the weakest link from the point of view of accurate sound reproduction (especially in higher end systems where we are pushing the boundaries of speaker technology). There are trade-offs with speaker designs such that certain combinations of system components may not work well together. If the speakers are borderline sibilent then a slighly elevated peak in the high frequency response of the cartridge (probably the second weakest link) could exasperate the issue then the brain takes it from there and focuses on this anoying problem possibley blowing it out of proportion. Bottom line, if you have a relatively well behaved sound system and want to enjoy the extra detail that extended high end frequncy response can give you and you are trying to keep to a modest budget I believe this is the cartridge to buy. It does a good job on the base, has a smooth midrange and does a clean, crisp job on the high frequencies. So far I find the cartidge to be just slightly forward sounding but I expect it to mellow some as it breaks in which should make it an extremely satisfying sound. If I ever get my hands on a good test album I will try and do some RTA analysis on the output signal from my pre-amp. This cart is over rated! It has a serious sibilance problem and only preforms well on top notch recordings, anything less and you will run out of the room with your ears bleeding! I am now a believer that the cartridge is a more important investment than the turntable itself. As an experiment I purchased a Dynavector 10X5 ($350) and mounted it on a 1981 entry level Onkyo table I picked-up for free and it totally blew away the Project Xpression/2M Red combo. My recommendation is to put the money where the needle hits the vinyl. By the way, the 10X5 sounds phenomenal on the Xpression. Ditch the Red! Nice, clean and lush, but slightly 'euphonic' sound quality. Very good tracking and generally high performance overall. 1.8 grams tracking weight, slightly on the heavy side in my opinion. Very high coil inductance, with the possibility of exacerbating phono preamp 'hiss' issues. Greetings, I recently posted a review of the Shure M97xE cartridge and as I also have an Ortofon 2M Red, a review of that cartridge is probably worthwhile. I actually purchased the cartridge during a period of lots of cartridge purchases (mostly Ortofon Super OM's), and I was keen to compare the two different Ortofon's! In some respects the 2M Red is quite revolutionary despite being the 'base' model in a large range of Ortofon 2M cartridges. Firstly, I wish that all cartridge manufacturers would adopt the new screw mounting system of the Ortofon 2M system....no more fiddling with tiny nuts! Overhang adjustment is still fiddly but a little less painful with the new mounting system! In my set up this cartridge appears to be well matched into the standard 47 k phono preamp input impedance. The output level is high and on a par with the Super OM series. Interestingly enough, the published specs show slightly higher output than the Super OM series but my ears suggest the (slight) reverse. I've learned long ago to 'distrust' published specifications a little! In general terms, the output level is high. Sonically this cartridge is interesting. It is actually a very nice 'sounding' cartridge, but not necessarily 'accurate'. On first audition I immediately noticed much more activity from my powered subwoofer (active below 100 Hz), suggesting a modest amount of bass peaking. This adds a judicious amount of warmth and roundness to all vinyl recordings. The effect is similar to switching on a 'loudness' control on a preamp. Remember those? In addition, there appears to be a slight dip in the range around 4 kHz which has the effect of increasing the prominence of the following treble as well as giving a lush, laidback quality. All these things combined, this cartridge seems to make all of my records 'sound' better than they really are! I repeat, a highly enjoyable sound, but not necessarily 'accurate'. A good word might be 'euphonic'. I regard my Shure M97xE as being more 'accurate' overall especially in the bass and midrange. Apart from the possibly 'euphonic' sonic qualities of this cartridge, the only other negative comments I have are the very high coil inductance (around 700 millihenries), which can exacerbate phono preamp 'hiss' issues, and the slightly high (in my view) recommended tracking weight of around 1.8 grams. I admit that I do not like tracking weights of more than 1.5 grams because of potential record wear issues. My learned friends advise me that 1.8 grams is quite acceptable in terms of record wear though, assuming that cartridge overhang is correctly set up. A slightly higher recommended tracking weight is also indicative of a slightly lower cartridge compliance. Summarising, the Ortofon 2M Red is a fine cartridge that makes all your records sound great, at the possible expense of sonic accuracy in absolute terms. This is an interesting point and I dare suggest the many listeners would prefer a cartridge that makes all records sound better than they really are, rather than a cartridge that 'tells the truth'. An example, I have a badly worn copy of The Beatles, 'Sergeant Peppers Lonely Hearts Band' album where the record wear is painfully obvious on all cartridges I have except the Ortofon 2M. Is that a good quality or bad? It is quite an enjoyable listen on the Ortofon 2M Red, but not with my other cartridges. Do you see my point? I guess it all comes down to one's listening preferences. Shure M97xe, Ortofon Super OM cartridges.